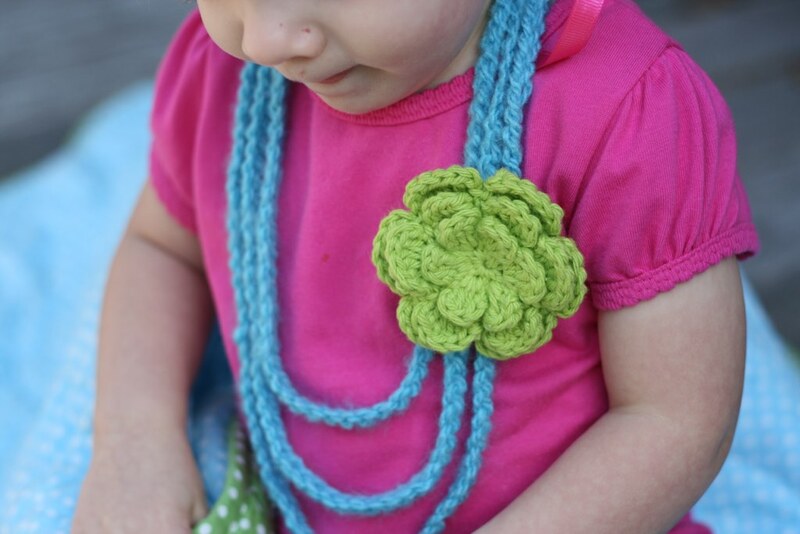 This chunky necklace is super simple and it put a big smile on my little girl’s face. I can’t really call this a crochet pattern, but I had to share just how adorably this project came out. I’ll share some general guidelines so that you’ll be able to make something very similar. The necklace is simply made out of chains. To start, you’ll probably want to use bulky yarn and chain somewhere around 50 (if it’s for an adult, you might need to make more). Then, slip stitch into the first chain to make a loop. At that point, start chaining again and make it a little bit longer. when you get done, slip stitch to the beginning again. Keep going until you have as many “necklaces” as you want.” Then, attach some sort of embellishment. This flower would be great. I’m not going to lie to you – the flower wants to fall towards the middle of the necklace. But, it’s so adorable… you could even attach the flower to a pin and pin that to the shirt AROUND the necklace? I don’t really know. I just know that I want to make this necklace work and have plans of trying it with a heavier bulky yarn and a lighter weight worsted weight yarn for the flower. The heart headband is easy, too. 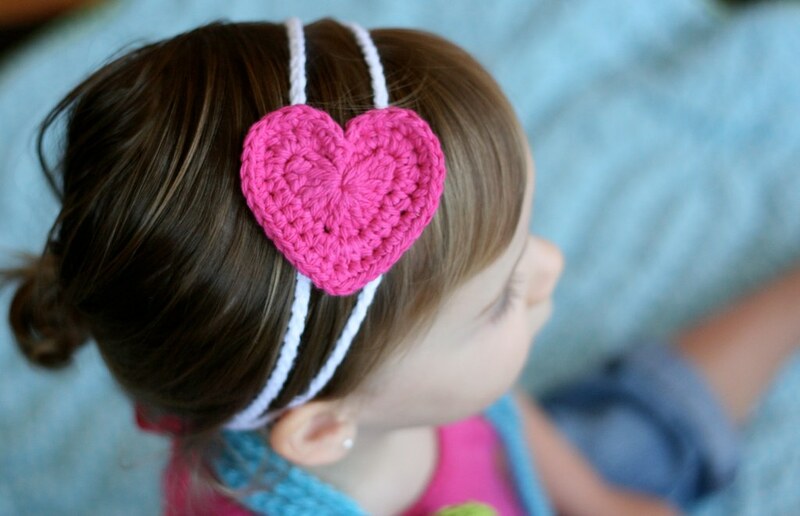 Just find a cute heart pattern, whip it up and attach it to the headband of your choice. I like a simple look so I made a simple chain headband, attached ribbon to the ends, and tied it in the back. It actually stayed on most of the day! Riley knocked it off a couple of times when she was trying to duck under something, but something that stays in for hours at a time is a winner in my book! I can’t wait to make more in different color combos. Riley definitely needs one in turquoise and lime. Cute site! I would love to hear all about your &#39;trading&#39; experiences. How does it start?